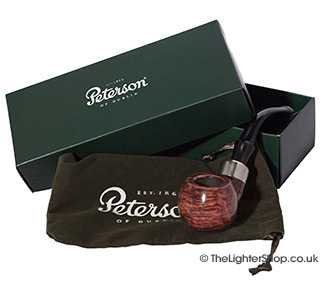 Started in Grafton Street, Dublin in 1865, Peterson pipes have become known across the world to be amongst the best quality and beautifully crafted pipes. Peterson offer several ranges of pipes of varying shapes and sizes which includes the Peterson System, Donegal Rocky and Killarney. One of the worlds leading manufacurer of pipes. Ideal gift for any pipe connoisseur or collector. Each pipe comes with a presentation box and velvet pouch.